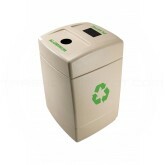 Environmentally friendly; molded from 25% post-consumer recycled plastics; this unit encourages recycling and reflects your concern for the environment. Universal recycle symbol with product labeling clearly identifies container as part of a recycling program. Unique disposal openings that are designed to accommodate specific recyclable material to eliminate unwanted litter. Container is extremely durable and weather resistant; won’t rust or chip. Perfect for indoor or outdoor use. Silk screened labeling clearly identifies opening. 4” diameter circle for “Aluminum” and 5 ½” H x 8 ½” W rounded opening for "Plastic". 2 1/2" H x 13" W for "Paper" and 6" H x 15" W for "Trash". 5 1/2" H x 13" W for "Mixed Recyclables" and 6" H x 15" W for "Trash". 55-gallon extra large capacity; two removable 27.5 gallon liners neatly stores your recyclable material. Patented Grab Bag™ system hold trash bag in place for a neat and clean appearance.